A relaxing album designed to support personal transformation and elevated consciousness. Why does music affect us so deeply? According to Dr. Bruce H. Lipton, it's because we don't just listen with our ears: we listen with every cell in our bodies. 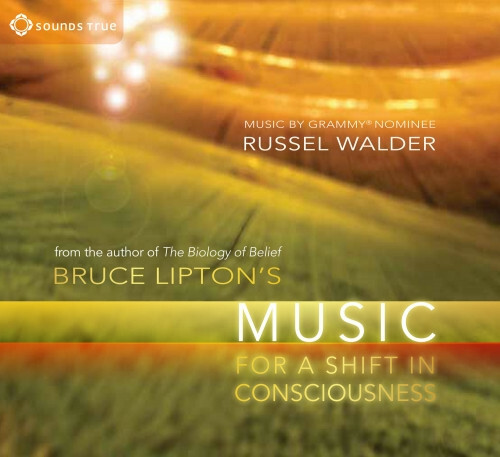 With Bruce Lipton's Music for a Shift in Consciousness, this pioneering scientist and author of The Biology of Belief enlists the creative talents of Grammy®-nominated composer and master oboist Russel Walder to create a one-of-a-kind album meant to support change at the deepest subconscious levels. "Chronic stress derived from today's high-pressure lifestyle is linked to almost every major illness people acquire," explains Dr. Lipton. "I believe Russel's soundtrack can induce an inner journey of transformation that can restore health, enhance creativity, and reignite your passion for life." Composed to facilitate a shift in brain activity from the dominant, highly focused, and excitable beta-wave state to the more relaxed, flowing, and calming alpha state, this richly textured and mesmerizing recording was mixed and mastered using the latest technology at director Peter Jackson's studio Park Road Post. Features bassist Tony Levin and vocalist Gingger Shankar.